I always work better in an environment that is surrounded in a pleasing esthetic. I believe that no space in your house should lack a little design element. The laundry room, closets and in this case, the craft room should all be functional, organized and yes, decorated. So, when I recently stumbled upon a small chicken feeder at a neighborhood garage sale (for only $.25—score!) 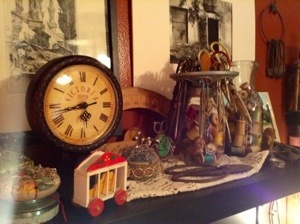 I knew exactly what I was going to use it for—to display my vintage scissor collection. I saw this idea for a scissor display using a chicken feeder several years ago. I wish I could remember where, so I could give credit where credit is due. None the less, I couldn’t wait to get home to create mine. 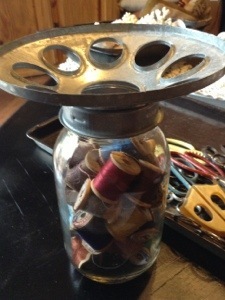 Here is what I used: A Mason Jar, spools of vintage thread, vintage scissors and of course the chicken feeder. First thing, take apart the chicken feeder by separating the bottom “dish” from the top section with the holes. 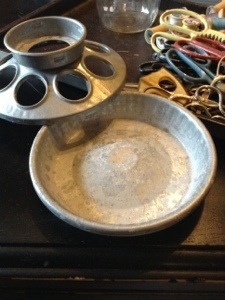 I did not need the “dish” portion for this project, so I placed it on top of my washing machine for a coin catcher. 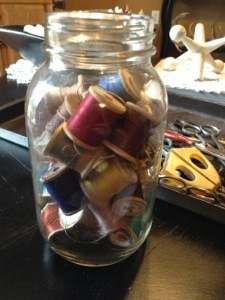 Next, fill the Mason Jar with the vintage spools of thread. I just randomly took a handful of thread spools from the boxes and boxes of thread that I have and placed them inside the jar. Yes, I did say boxes and boxes of thread spools. 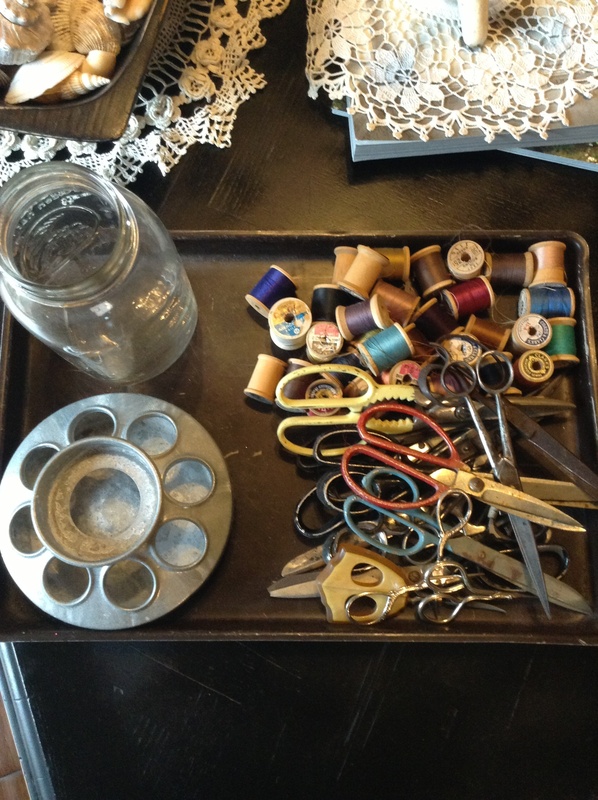 There are a few things that I cannot pass up on buying, no matter how many I have and vintage thread is one of them. Now, the cool thing about the chicken feeder top is that it just fits perfectly with a little turn, on top of a standard mouth opening of a Mason Jar. 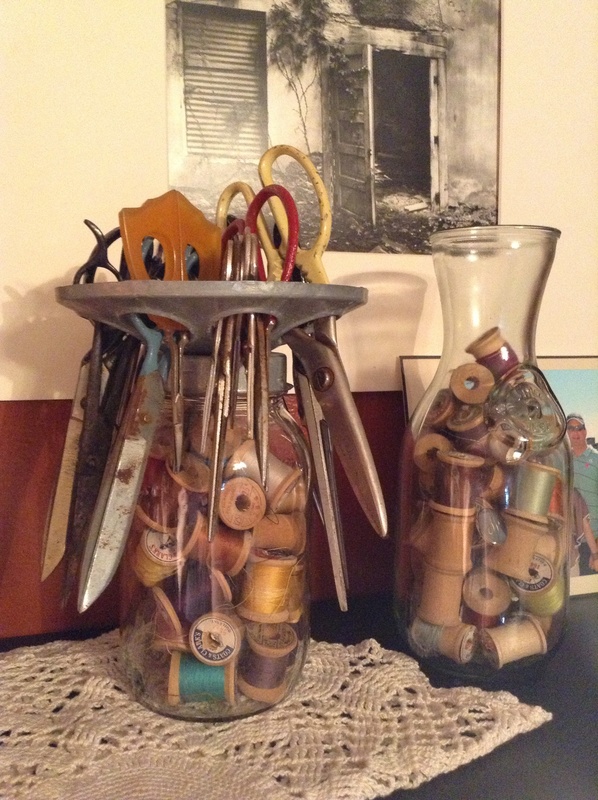 I took a little more time when filling the holes with the vintage scissors, than I did with the thread. I wanted all of my favs together, so when I displayed the jar, they would be front and center. 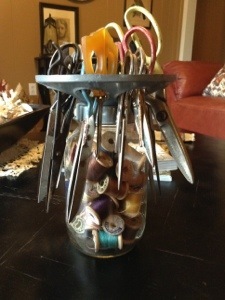 I displayed it on a shelf above my crafting table with some other vintage sewing goodies like pin cushions and YES—more thread spools. I just can’t get enough of them!